What is a Professional Screencast Software? All screencast software are great in their own ways. But, the truth is that the best ones always have prominently common features. The days of very basic screencast software are gone forever, challenged by professional tools with smart screen capturing technology like ActivePresenter. So how does a professional screencast software look like? In this article, we will go through a list of features that a professional screencast software must have. And with this in mind, you can choose the best one for you or develop your desired app that satisfies your prospects. Before going into details, note that the concept of “professional screencast” used in the scope of this post just implies the most crucial aspects. Specifically, they are ease of use, audio and mouse movements recording, built-in video editor, output formats, software update frequency, and the quality of support services. Now, let’s dive deeper into each of them. Top 7 Features that All Professional Screencast Software Must Have! Many people usually think that a professional application often comes with some obstacles. For example, it’s hard to use for the first time, and thus, users will have to spend much more time on understanding precisely how it works. This approach is also known as a long (or steep) learning curve. However, in contrast with this common sense, I want to emphasize that a professional tool should aim for ease of use. Obviously, you cannot expect to learn how to manipulate it in a matter of minutes, but it shouldn’t take much time. When it comes to the level of ease-of-use, I want to mention a clean and intuitive user interface as well. To demonstrate, I will take an example of ActivePresenter – a 2-in-1 tool allowing users to create screencasts and design interactive eLearning contents. 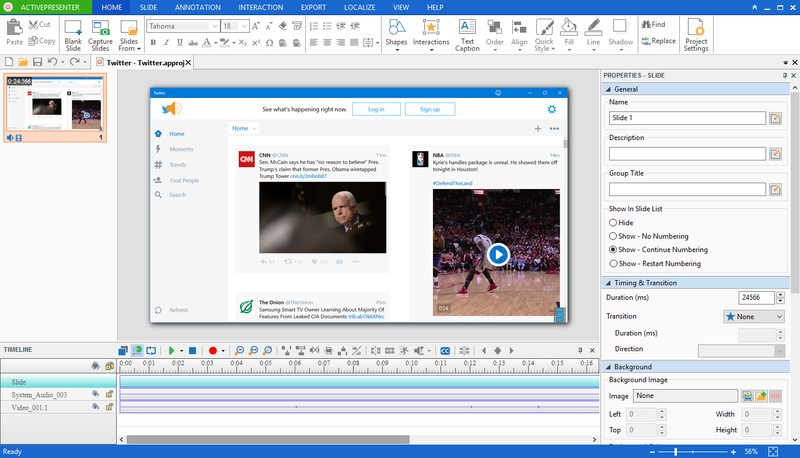 As you can see, this tool has a very friendly interface with a tabbed toolbar placed at the top of working screen, the Timeline editor at the bottom and the Canvas in the center. Besides, the left and right sides are Slide Pane and Properties Pane respectively. With such a proper arrangement, ActivePresenter makes it easier for users to navigate and choose the tab or button they want during the working process. 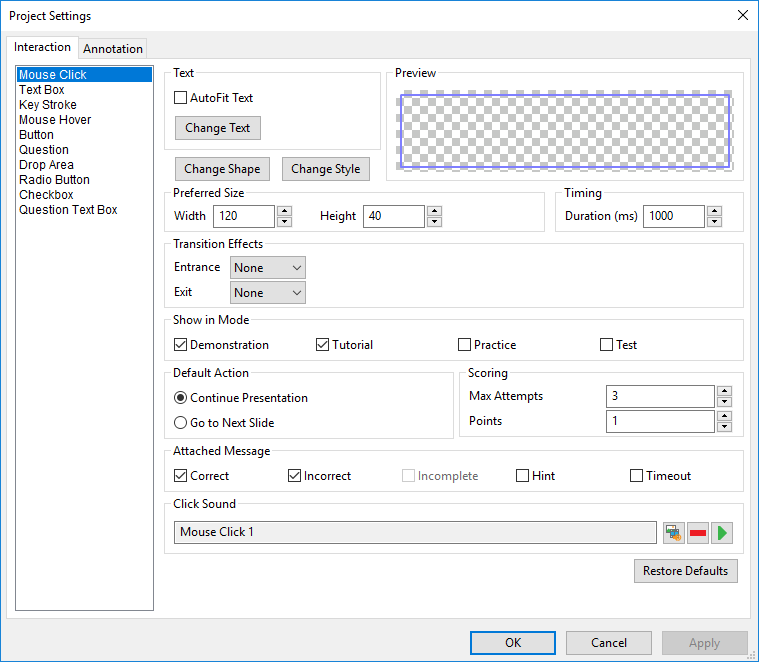 Another key aspect to highlight is that ActivePresenter has a user-centered and familiar-PowerPoint interface with many similar design principles. However, it doesn’t rely heavily on design and text-based ones of Microsoft PowerPoint like Articulate Storyline. What’s more, ActivePresenter also allows you to customize a variety of buttons and functionalities. For instance, access Project Settings or Preferences to change default settings of your working project or all projects created by ActivePresenter. To further modify annotation and interactive objects, just go to the Properties Pane and adjust each of section on it. Last but not least, most users always hope that their desired screencast software doesn’t have much impact on their computer and other previously installed applications. Any lag or instability makes them become unbearable and even drives them to uninstall that tool. Don’t be surprised when I put the capability to record audio in the must-have features list of a professional screencast software. Although there is a variety of screen recording software now available in the market, some of them still don’t support this vital function, especially recording sound from microphone. Because of this, if you want to record all types of sounds, from audio system to voice narration, bear this feature in mind. 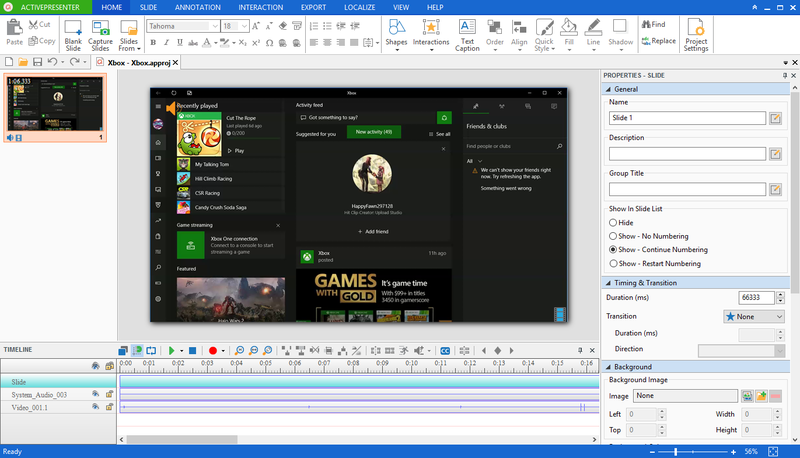 I highly recommend you should take a glance at ActivePresenter and Camtasia. Having said that, the latter seems to be a little difficult to use if you are a novice in the field of technology. Talking about a professional screencast software to create video tutorials, the ability to record mouse movements does matter. Through this capability, users probably do not need to insert too many callouts and shapes for clearly explaining their messages. Their audience just follow recorded clicks and mouse movements to know what next steps are as well as what they have to do. In many cases, it is also vital that the recorded mouse movement should also be editable later if needed. Unfortunately, except some screen recording tools like ActivePresenter, the rest still doesn’t provide this capability. No one wants to install two separate applications on their computer if there is only one that can cover all their desired features. The truth remains the same when it comes to choosing a screen recorder with the ability to record screen and edit it after that. If your purpose is to make an explainer video or a video tutorial, you should choose a 2-in-1 tool like ActivePresenter to reserve time and disk storage on your computer. Most importantly, screencast software with built-in audio/video editor help reserving your video quality during the whole production process. With built-in audio editor, you can also easily record or make changes to the voice-overs later in the editing phase if desired. Furthermore, you also don’t have to launch two apps simultaneously. Let’s find out this functionality of ActivePresenter below. After finishing recording, ActivePresenter automatically transfers your newly captured video into the editing screen (see the picture above). As stated earlier, the Timeline pane at the bottom contains basic and advanced editing tools such as Cut, Crop, Delete, Voice Narration, Blur Effect, Changing Speed and Changing Volume. Just select your desired video range and click any tool, changes will be applied immediately. Added to that, ActivePresenter also provides a vast number of transition effects, annotation and interactive objects. You can get the most out of them to make your recorded videos become more impressive and engaging. The ability to export captured videos to popular formats such as MP4, MKV and AVI is one of the key features of professional screen recording tools. Gone are those days that some software like Camstudio only enables users to export videos in AVI format. From this table, ActivePresenter is clearly the most impressive screencast software with 7 types of output formats supported. By using this software, you can easily create how-to videos with incredibly high quality and export videos directly to your desired format without having to convert. Additionally, ActivePresenter also offers the Record Software Demonstration mode for those who prefer a lossless codec. For those who want a lossy codec, just pick up the Record Movie/Streaming Video capture profile. Maintaining and supporting an app after releasing its first version are much more important that most users don’t know. A successful story of any software is always attached to frequent updates about 1 to 4 times a month. Because developers understand a true fact that updating apps is one of the powerful marketing tools they have at their disposal. There is a convincing reason why app updates matter: They create an instant and effective connection between software developers and users. Usually, updates include relevant and reported bug fixes as well as add some new features that users expect. As a result, their credibility and commitment to an app will be on the rise. Take a closer look at some screen recording tools available now in the market. As you can notice, Camstudio is an open source with rare updates and lack of highly detailed tutorials. So, it is not surprising that many users have a tendency to pick up a better alternative. Building a community where users can join and discuss all problems relating to your app is a key factor to boost users’ satisfaction and engagement in the long haul. Keep in mind that don’t let your leads wait so long. Instead, reply their questions and help them to solve their problems as soon as possible. ActivePresenter online community is a good example for this. Similar to updates, supporting channels and documentation are also important ways to communicate with customers that developers should not ignore. When users browse a website of a screencast software, they are usually looking for tutorial series, demos and other guide documents during the downloading phase. In other words, they attempt to find some types of instructions that can help them overcome initial obstacles along the way. This is where developers need to focus on in order for meeting customers’ needs and expectations. No matter how amazing your app is and what features are available in it. If you don’t provide your potential customers those useful and essential documents, it is highly possible that they will leave you soon. Don’t make their learning curve steeper if you can help them out. Now you gain a clearer understanding of how a professional screencast software looks like. Come and download ActivePresenter to have the very first experience of a pro tool! If you want to add something to our list or share your idea with the world, please feel free to join our online community, Facebook or YouTube and send a message to us.